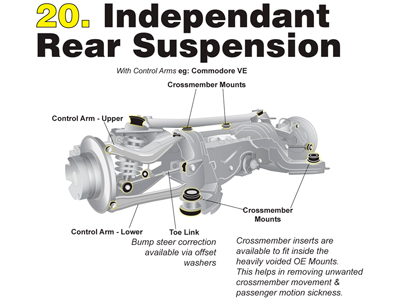 The faulty stock rubber differential bushings were allowing for way to much range of motion of the differential leading to a loss of power and speed. Fortunately, Whiteline has addressed the issue with part number W93356. 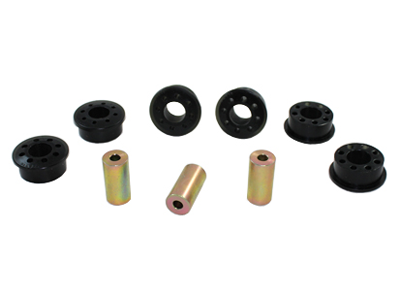 These differential bushings are made of synthetic elastomer, so they are much more durable than any rubber bushing. With the added firmness, you should see a slight increase in vibration, but the tradeoff is more than worth it. These Whiteline bushings will eliminate the excess differential movement; allowing your pinion angles to operate appropriately, giving you maximum power transfer to your wheels for increased speed on the street and the track.